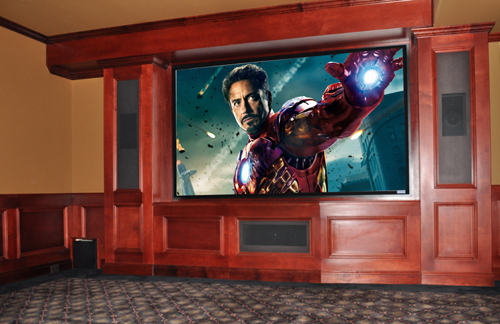 Let us plan your space whether it be a Full Dedicated Home Theater Room or a Multi-Purpose Family Room or Den. Either design can be a fantastic experience! Audio By Design will guide you through every aspect of your project including: Design and Layout, Product Selection, Installation, Training and Support. Our multi-room home audio systems can be installed in new construction and can also be retrofitted for most existing homes. We can install your equipment in a remote location, eliminating the need for components in your main living spaces. 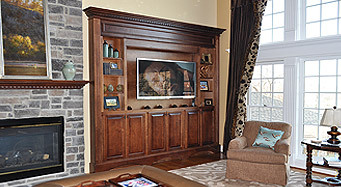 Speakers can be recessed in the walls or ceilings of your rooms for a clean, custom look. Lutron RadioRA 2 is a wireless home control system for Lighting. This energy-saving system gives you the ability to turn light on and off in and outside your home. With light control, you’ll always have a warm welcome home. Turn lights on from the comfort of your car, before you even reach your front door. That way, you won’t have to walk into a dark house, and it will also open up your garage door. Time clock—use the time clock to set exterior lights to turn on every day at sun set and dim overnight to save energy and extend bulb life. Away mode—schedule lighting changes so an empty house appears occupied; lighting changes can vary each day for different rooms. Set your Mood lighting, with the push of one button, it will turn some lights on, some lights off and dim others. Mood settings can include watching TV, Reading, Dining, Entertaining, Going to sleep, Bedside Panic button (all light ON) and more. System design and programmed by our certified technicians. Integrate a camera system into your Home TVs. See who’s approaching the house or who’s at the front door with a single push of a button on our Custom Remote Controls. With the addition of a DVR, you can record and monitor from your home or Smart Phone, iPad or laptop. Let us wire your New or Existing Home with Structured Cable. Structured Cable refers to various types of bundled wiring installed in a home for the distribution of audio, video, telephone and data signals. It includes various combinations of RG-6 or RG-59 video cable, CAT-5 (or higher) network wiring, fiber optic and audio cabling. 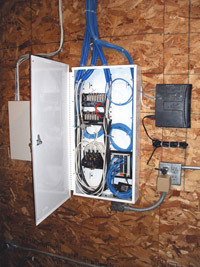 Structured wiring will allow you to get all your current and future use needs up and running. It enables the distribution of audio, video, computer data and telephone signals throughout a home.